The Penguin Style is an iconic catalog on Club Penguin Rewritten, which contains all the latest clothing and lots of secrets! 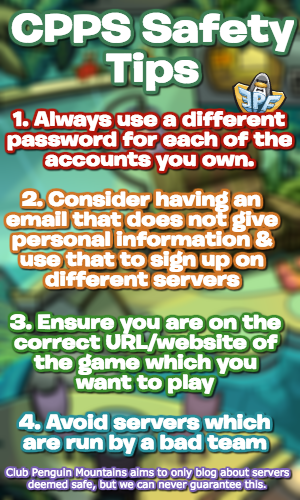 This page will walk through the catalog and explain all the cheats/guides. There are never any secrets on the colour selection or “Custom Hoodie” pages, so let’s just skip to the main bit of the catalog. A blue/red circle represents that a secret is hidden there and the image next to it is the item which you can get by clicking there. Page one contains several secrets: the Flower Hat and Basket, along with the White Cocoa Bunny Ears and Costume. Page two contains a further four secrets, the Brown Striped Fedora, the Lavish, the Green Hard Hat and the Green Recycle Shirt. Page three contains a further four secrets: the Curly Mustache, the Water Wings, the Star Necklace and the Viking Helmet. As always, you can click the location of the Viking Helmet three times for the Blue Viking Helmet. Page four contains several secrets: the Pot O’ Gold, the Patty’s Hat, the Green Bowtie, the Green Fedora, the Green Zippered Hoodie and the Clover Basket. Page five contains a further three secrets, the Blue Turtleneck, the Green Top Hat and the Viking Helmet. As always, click the location of the Red Viking Helmet three times for the blue one. Page six contains a further three secrets: the 3D Glasses, the Bunny Slippers and The Dizzy. Page 7 contains four secrets: the Life Jacket, the Blue Board Shorts, the Brown Sandals and The Wavecatcher. Page 8 contains a further three secrets, the Purple Wetsuit & Flippers, and also the Pink Snorkel. Page 9 contains a further three secrets: the Viking Helmet, the Red Sneakers and The Brunette. As always, click the location of the Viking Helmet three times for the Blue Viking Helmet! Page 10 contains five secrets: the Starlit Sombrero, the Blue Torero Suit, the Fiesta Dress, the Saturated Sombrero and the Saturated Poncho. Page 11 also contains four secrets, which are the Spikette, the Spikester Cuffs, the Flitter Flutter and the Spikester Threads. Page 12 contains a further three secrets: the Pink Sneakers, the Viking Helmet and the Gold Wristwatch. 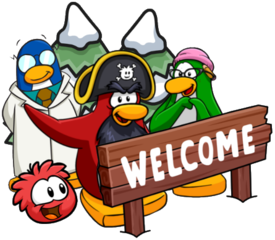 You will then find a variety of background images and flag pins, as well as the Penguins at Work section & Item of the Month! Neither of them have any secrets on them, so feel free to purchase whatever you like.